Join us to discuss the importance of training that is documented, cited, referenced & easily defensible. 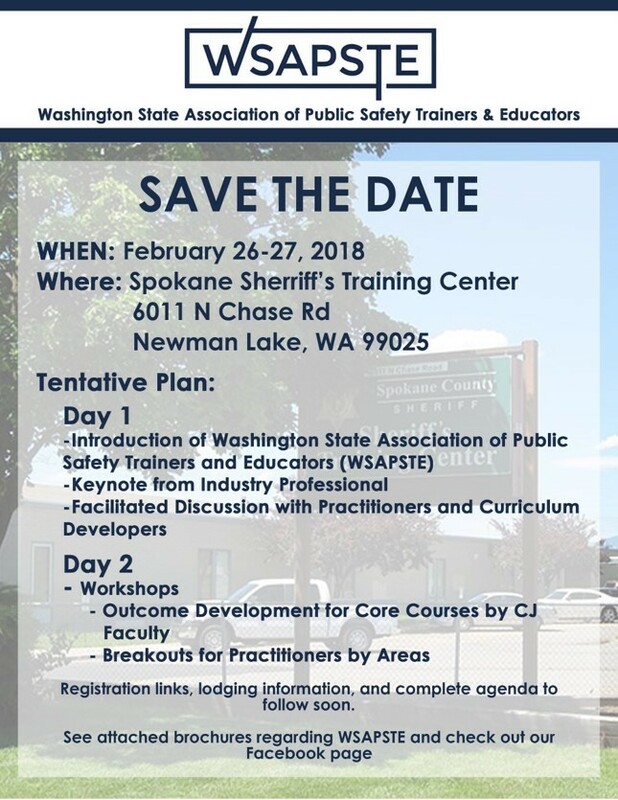 The Center is pleased to announce the 2018 Washington State Association of Public Safety Trainers and Educators (WSAPSTE) Conference, February 26-27, at the Spokane Sherriff’s Training Center in Newman Lake, WA. The public relies on a variety of services to provide safety and security in everyday life. These services are usually run by governmental agencies at local, state or federal levels. Public safety management professionals ensure these services are run in an efficient and orderly manner and that safety needs are being met. Trust between public safety, law enforcement, and the public they protect and serve is essential. This conference will discuss how to build curriculum and training that can withstand legal scrutiny. Presenters will increase your knowledge of instructional systems design and occupational analysis while avoiding implicit bias. Individual breakout sessions provide the opportunity to network and learn with professionals in related fields. WSAPASTE was founded in 2017 to provide opportunities for practitioners and educators in the field to come together to collaborate and learn exchange ideas with the goals of increasing public safety through best practices. It is critically important to bring the public safety practitioners and employers together with educators to understand and learn about the demands and changes that are occurring in today’s public safety organizations and assess the impact on current training and education programs. One of the primary objectives of community and technical colleges (CTC) is to provide training and education required for students to best ensure their success in the workplace. CTC colleges and their faculty and staff need to be prepared to provide their students with the high quality multipurpose curriculum they will need to secure 21st Century jobs in this career field. This annual conference and other workshops and training opportunities that will be part of the Associations activities provide that opportunity for educators meet on with professionals doing the jobs on-the-ground which help ensure CTC programs will remain “cutting edge”.